July 2008 - MAG Cincinnati (Hebron, KY) begins take-off roll for TECT Aerospace on a high-powered cell for automated machining of large titanium airframe components. 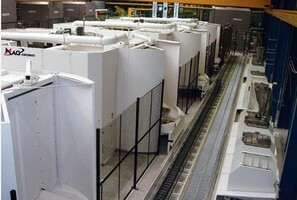 The TECT order covers a three-machine five-axis machining cell and processing methodology. Ordered for TECT's Wellington, Kansas manufacturing plant, the CINCRON® Cell system integrates three MEGA 5 five-axis 800 mm horizontal machining centers (HMCs). The first machine shipped the first quarter of 2008. The final two HMCs are shipping the current quarter with cell completion and acceptance scheduled for the fourth quarter, said MAG officials. The order includes "teamkey" development of the machining process, fixturing, programming and tooling. MAG Maintenance Technologies, a sister organization to MAG Cincinnati, will provide the tooling and final run-off. TECT Corporation (Turbine Engine Components Technologies) is a privately held, custom manufacturing services supplier of semi-finished and finished components and assemblies; including, airframe structures, aircraft assemblies, solid and hollow fan blades, compressor blades and vanes, BLISKs, IBRs, impellers, diffusers, turbine airfoils, rotor shafts and hubs, disks, oversized and precision forgings, and other hardware. Headquartered in Thomasville, GA, TECT serves the aerospace, power generation, rail, off-highway, automotive and other industries from its operations in Cleveland, OH; Everett, WA; Kent, WA; Newington, CT; Santa Fe Springs, CA; Thomasville, GA; Utica, NY; and Wellington and Wichita, KS. MAG Cincinnati, a company of MAG Industrial Automation Systems, designs, builds and integrates advanced manufacturing solutions for the global aerospace, heavy equipment, energy and general machining markets. The company's broad machine tool line includes automated composites processing equipment, profilers, routers, large horizontal and vertical machining centers including 5-axis, multi-tasking and cells. MAG Maintenance Technologies provides single-source maintenance and productivity solutions designed to optimize plant operations. Operating major hubs in the United States, Germany, China and Brazil, the company stocks $80 million of dedicated inventory supporting over 50 brands of current and legacy machine tools for MAG Industrial Automation Systems. MAG Industrial Automation Systems is a group of leading machine tool and systems companies serving the durable-goods industry, worldwide, with a large portfolio of highly-recognized and well-respected brands. With manufacturing operations on five continents, MAG ranks as a leader in the global metalworking capital equipment market.